ROBOT & FRANK is a delicate film that breaks your heart, makes you think, and all with the lightest of touch. It's also an astonishingly assured debut feature from Jake Schreier (director) and Christopher D Ford (screenplay). Set in the near future, Frank Langella plays a retired cat burgler called Frank, afflicted by Alzheimer's but charmingly no-nonsense and wily. His concerned son Harrison (James Marsden) buys Frank a Robot (voiced by Peter Sarsgaard) to get him onto a routine and make sure he eats right. Frank is wary at first, but eventually warms to the Robot who provides him with companionship, and indeed, facilitates a return to crime - ripping off their smarmy yuppie neighbours. The movie works on many levels. At its most obvious, it's a loose sci-fi film, although those viewers looking for detailed applications of the laws of robotics per Asimov will be disappointed. Instead, the film is more concerned with the emotional implications of forming an attachment to a robot, and plays more like the most intelligent buddy-movie you've ever seen. All this despite the fact that Robot is always reminding Frank that the friendship can't be real because Robot is, well, just a robot. The sad fact remains that for Frank, Robot is a much more real emotional presence than his distant son or irritatingly right-on daughter (Liv Tyler). There's also a light critique of urban yuppies moving to the country, an a melancholy lament for the printed word that touched a chord with me. Frank Langella gives a charismatic central performance as Frank. He's charming and grouchy all at once, but never in that mean grinchy Clint Eastwood way. He always keeps us guessing as to how much Frank really knows what's happening, and how much his Alzheimer's is taking over. I really loved Peter Sarsgaard as Robot too. He has a melancholy tone to his voice that's just perfect - there's empathy if you want to read it that way, but neutrality if you don't. I cared about the two of them, even though Robot was telling me not too. Special mention too for Susan Sarandon who gives perhaps the most challenging performance in a small role as a librarian that Frank befriends. Overall, ROBOT & FRANK is one of those surprising rare birds - a fragile movie that wears its deep thinking lightly and creates memorable characters and stirs deep emotions. I'm not ashamed to say that in two deeply poignant scenes near the end of the film, it got a little dusty in the theatre. ROBOT & FRANK played Sundance 2012 where Jake Schreier won the Alfred P Sloan Feature Film Prize, and Sitges 2012 where he won the Audience Award for Best Feature Film. It was released earlier this year in the USA, Canada, France, Kosovo, Kuwait, Taiwan, Germany, the Netherlands, Sweden, Australia and New Zealand. It opens in Hong Kong on January 31st; in Portugal on March 7th; in the UK on March 8th; and in Spain on May 24th. 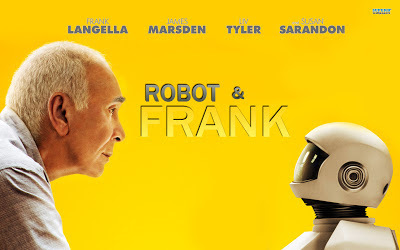 ROBOT & FRANK has a 89 minute running time and was rated PG-13 in the USA.